With the recent trend in films surrounding the Chinese Revolution of 1911 , it's of no surprise to see another entry with it's own take on the events. But for this film we concentrate on the story of one Qiu Jin a Chinese patriot who fought for woman's rights as well as going against the rule of the Qing Dynasty and the indulgent life of the Empress Dowager. Qiu Jin was born into a wealthy family,but from the outset went against the do and don’t s of woman hood in the Qing Dynasty. Qiu Jin was also interested in swordsmanship and wanted to fight for China and it's people from a early age. She also became famous for her poetry which again was a outspoken way of getting across her views of equal rights for woman ( a bit like the suffragettes chaining them selves to railings in Victorian England) , but many men also sympathized with her views and one was a known activist who she would eventually meet and realize her life's goal. Her father taught her the ways of the sword and educated her in the world,she wanted to banish the cruel foot-binding young girls went through ,just so their feet could look small and cute .Truth be told having your feet bound so bones break as they grow was a painful experience for all females in China as this was a law imposed by Imperial rule. 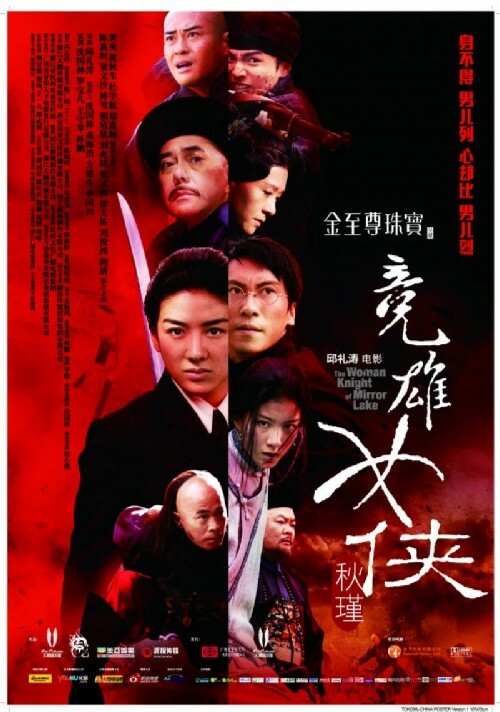 The film is told in flashback from the prison cell Qiu Jin occupies having been taken prisoner by the Manchu. We start by seeing the Manchu storming the school that Qiu Jin runs for civilian tutelage in calligraphy,weapons training ,and other useful techniques which will prepare locals for life in the Qing Empire. Or at least that's what the Qing believe, in fact It was a training ground for revolutionaries who where preparing for the day they would crush the Empire. It's here that she is accused of taking part in a uprising ,and is duly taken to court and questioned and tortured. The film then flashbacks to how this all came about and how she became intent on fighting for woman’s rights and Chinese .freedom. The main point In her life that seems to ignite her passion for the fight for freedom is when her arranged marriage to a young government official by the name of Ting-Jun sees her moving to Beijing. It's here that Qiu witnesses the poverty of woman and children begging for food. And when government guards arrive beating the poor peasants to make way for a Westerners carriage ,Qiu can take no more and confronts the guards using her martial skills. Disgusted by these occurrences Qiu delves further into the reasoning behind what can and can not be done . More so after seeing a Young chained girl named Fusheng who is in a a arranged marriage to a nasty fellow who makes her work hard and beats her in the process. She without hesitation ransoms the girl who then becomes Qiu's friend and so called nanny to her children . When one of her children fall ill ,Qiu rushes to find a doctor, she ends up meeting another Feminist who not only helps her child but also lights another fuse within Qiu that inspires her further in her Quest . When she goes out dressed as a man to highlight the fact that she should be able to wear what she likes and do as men do ,she gets berated by her husband Ting -Jun who gets humiliated by the events. Ting -Jun is a good man but his position in office makes his life follow certain rules, he to would like change if truth be known ,but he is happy to live his life ,not get involved and enjoy his freedom he gets being a man. He more or less begs Qiu to stop her obsessions with trying to change the world. It's this that triggers Qiu's abandonment of her Children and husband to go to Japan and study ,here she thinks she can ignite a feminist movement , it's also here she will meet Revolutionary leader Xu Xillin ( Dennis To ), though their goals seem easier to to instigate at first , it is apparent that the Japanese authorities won't put up with demonstrating Chinese in their towns and cities. Arriving back in China and returning to her husband who has become more of a homely type due to duty and health by the looks of it. Qiu realizes she has to gain the trust of her husband and her children again ,saying she has many debts her husband offers to pay them off. This is of course a ruse as from what I could see , because it is not long before she once again vanishes ,leaving a letter with her youngest explaining why she has to do what she does. It's pretty obvious that the money was used to recruit and start her Civilian school ,Daitong College. It’s from this base that Qiu would enlighten woman and men who believed that it was time for change before the Qing Dynasty destroy China . Now I have not seen every film about the Chinese Revolution ,of the recent ones other then this of course I have seen Jackie Chan's ''1911'' and the previous years ''Bodyguards and Assassins'', Both those films failed in thoroughly entertaining me throughout their running time. But I must say that Herman Yau has pulled of something quite brilliant here ,not only has he got across the plights of the Chinese people leading up to the 1911 Revolution ,he has highlighted a story of one of China's heroes ,who you may have not heard about but for this film. Now some may say the martial art scenes where over done slightly with use of some wire work ,which is evident . But saying that it does push forward the frustration of Qiu Jin in her fight for freedom for the people. A word must go to Huang Yi who portrays Qiu Jin, her performance as the Chinese Hero is breathtaking ,she really shows the plight of the people in the anguish her character omits. Add to this a good supporting cast which included Anthony Wong as Li Zhong-Yue.and Lam Suet as provincial Governor Gui-Fu.. It's quite crazy really that both the aforementioned films probably cost three times or more to make and have not come close in matching the heart felt power of this film. You have to give Herman Yau his due he delivered a worthy Ip Man prequel with Dennis To and one which I preferred over the second Donnie Yen film. And here he has delivered a story of the peoples fight for freedom and at the same time entertained for the films entire running time. The Legend is Born -Ip Man / 2010 - Dennis To stars as Ip Man ,with Ip Chun .